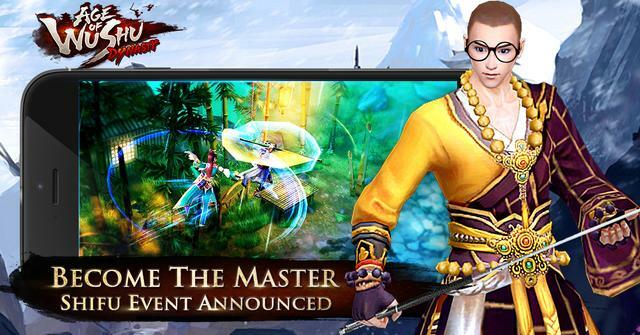 Become the Ultimate Master - Shifu Event! As new players join the ranks of martial arts heroes, we are looking for those who have been with us since the beginning to help them on their way! In order to better share all the knowledge our clever masters have acquired, we're very excited to announce our new event - the "Shifu Event!" For those who may not know, a "Shi Fu" is a term for a master or teacher in traditional Kung Fu. We want to give the opportunity for you all to share your knowledge and earn the right to call yourselves a true master of martial arts. New players are invited to ask their questions in Posts in the "User Guide" section of the Forum. These questions can vary from explanations of basic game systems to strategies to build their warrior. Players who comment on these questions with useful and thoughtful responses will be eligible to receive a special in-game "ShiFu" title as a reward! Those posting their instructive responses should be sure to post their IGN and server in their response as well. Every week we'll review the question threads, and pick out the most helpful "Shi Fu's" to win the reward! Join the event and help share your knowledge with new players and win an exclusive title for it! "Those posting their instructive responses should be sure to post their IGN and server in their response as well." Last edited by 116666324529676120149 on Sun Apr 10, 2016 7:24 am, edited 1 time in total. Ready to Help you Guys..
Been playing 1 week and I'm already a shifu. OMG what are you people doing?